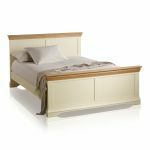 Characterised by a distinctive two-tone finish, the Country Cottage Natural Oak and Painted King-Size Bed offers style, practicality and durability. Handmade by skilled craftsman from A-grade solid hardwood, it features a cream painted finish with wonderfully contrasting natural solid oak tops. The elegantly flared cornices, arches bases and exquisite panelling all form part of our contemporary take on a classic French design. 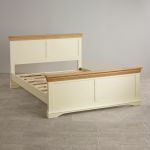 A sophisticated standalone addition for any bedroom, this king-size bed will also be an ideal match for the Country Cottage Bedside Chest and Country Cottage Wardrobe. 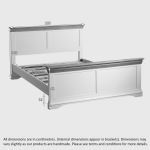 Why not take a look at the rest of this range to discover painted furniture items for every room in your home?